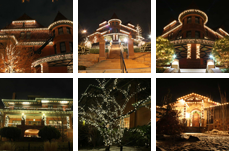 Clean Cut Lighting is dedicated to provide you with the highest quality Christmas light installation service in Utah & Salt Lake Counties for the lowest reasonable price. Hanging Christmas lights on the roof-line of a home or business is the bread and butter of our company. 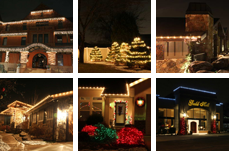 Our fee for the installation, service calls and take down for your Christmas lighting decor in Utah is marked at competitive pricing. At our great prices it’s worth every penny knowing you don’t have to get on your roof in the cold. CHRISTMAS LIGHT MATERIAL SOLD AT AWESOME PRICES!!! We want your business!!! So, to help motivate you to have our company install your Christmas lights this season, we slash the prices on your material. We sell you the material at near wholesale pricing. We use the highest quality professional grade lights in order to keep you happy. CHRISTMAS LIGHTS IN TREES, BUSHES AND MORE!!! 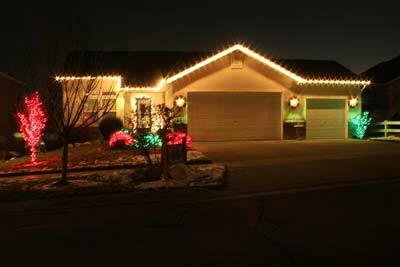 Clean Cut Lighting provides a wide range of Utah Christmas light installation services in Utah. We install lights in trees, on pillars, in bushes and more. Prices vary per job on these services. However, don’t forget that our estimations area always free. Go ahead and book your estimation so we can come meet you. We still want your business!!! Each job requires extension cords and other extra things in order to complete your Christmas light installation. I’m willing to use quality material you have and if you need more we still offer very reasonable prices for the extra stuff. These things will be included in the estimation so go ahead and book your estimation now!!! Be sure to check out our other services which include Wedding Lighting and Special Event Lighting.